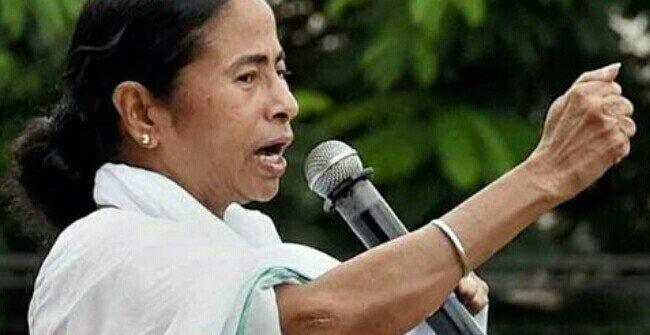 Challenge accepted, West Bengal Chief Minister Mamata Banerjee said today, vowing to "capture Delhi." She was responding to BJP chief Amit Shah's targeted attack on her and her Trinamool Congress during a two-day visit to the state aimed at rapidly expanding his party's footprint in West Bengal, where it has so far had limited political presence. Mr Shah has handed his Bengal BJP team the task of uprooting the ruling Trinamool Congress by 2019. "I accept the challenge of those who challenge me. We'll capture Delhi," Mamata Banerjee declared, accusing the BJP of trying to "intimidate" the Trinamool Congress. "They come from Delhi and spread lies. They are in a hurry (to capture power in Bengal)....They cannot handle Gujarat, but they are eyeing Bengal," the Chief Minister added. She criticised the BJP chief 's booth-level interactions and visits to modest village and slum homes, saying, "They go to slums in the morning and eat dinner at five star hotels at night. Such is their double standards...I go to the slums everyday. It is not right to call the poor, poor. I respect all the poor and struggling people." Amit Shah picked West Bengal to begin a 15-day journey across five states where the BJP has traditionally been weak. The immediate aim is to strengthen the party cadre in each and win many more parliament seats from there by 2019, when Prime Minister Narendra Modi will seek a second term. The BJP chief challenged Ms Banerjee directly on her turf. After visiting Naxalbari in north Bengal, where he ate lunch sitting cross-legged in the tin-roofed hut of farm worker Geeta Mahali, Mr Shah went to Mamata Banerjee's assembly constituency Bhawanipore in south Kolkata and visited three homes in a slum. He was greeted warmly by residents who showered him with flower petals and offered him sweets. Mr Shah discussed their problems and promised the people of Bhawanipore that Prime Minister Narendra Modi's "chariot of victory" will roll into Bengal in 2019" bringing with it the development that, he said, they have been denied. For today's counter-attack, Ms Banerjee chose Birpara, which is part of the Madarihat assembly constituency, one of four seats that the BJP won in the West Bengal elections last year. "I have come to Birpara before. Birpara voted for BJP, not the Trinamool, but I have come here again to show that the BJP lied before the election. They said they would open seven tea gardens in the region. That has not happened," the Chief Minister said. Mr Shah has alleged that Bengal under Ms Banerjee "symbolises unemployment, violence and appeasement politics." As he wound up his Bengal visit, Mr Shah told party workers today reach out to the people, who he said have become "disillusioned" with the state's ruling Trinamool Congress, while the opposition Congress and CPI-M have "significantly lost" their political relevance. The BJP must take advantage of that and bring more people into the party's fold, a Bengal BJP leader quoted Mr Shah as saying. The BJP's message, Mr Shah instructed, must be that "development in Bengal is impossible without the BJP."